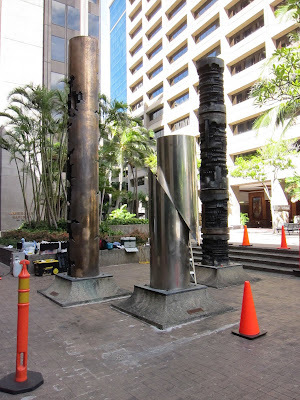 For the past month we have been working on the conservation of three monumental columns by Italian sculpture Arnaldo Pomodoro in the Bank of Hawaii Collection. Made respectively of polished and patinated bronze, mirror-finish stainless steel, and concrete with mild steel bands, these sculptures are being treated in collaboration with technician Michael Jones of Honolulu's Art Services. The tropical climate and proximity to the coast have taken their toll on the sculptures' surfaces. The polished steel is clouded, the mild steel deeply pitted and corroded, and the concrete is faded, cracking, and eroded. Most interestingly, the bronze sculpture, which had been previously lacquered, exhibits a deep and overall pattern of red cuprite pitting on its polished surfaces. Treatment is giving us a great deal of information on the behavior of the aforementioned metals in an extreme tropical climate.